A military man, George Stoneman was born in New York in 1822. He attended Jamestown Academy in Jamestown, NY. Stoneman was appointed to West Point Military Academy in 1842. He graduated from West Point in 1846 with high honors. Soon after graduating from West Point, Stoneman served in the Mexican War. Stoneman was in command of the San Francisco Presidio in 1848 and 1849. After arriving in California, Stoneman was appointed to be in command of the San Francisco Presidio. Later, he served in the Civil War and rose to the rank of colonel. In 1870, President Grant sent Stoneman to command the Department of Arizona, a post he held until 1871. Stoneman moved to California where he was a rancher for the next several years. 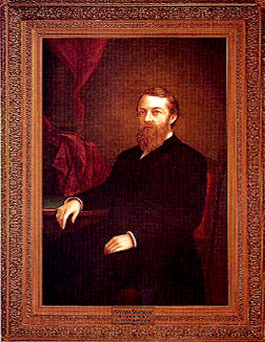 In 1876, Stoneman was appointed to the California Transportation Commission. He served on the Federal Indian Commission in 1878. His first elected position was as a commissioner of the Railroad Commission in 1879. Stoneman was inaugurated as Governor on January 10, 1883. He advocated controlling rates and limiting the power of the Southern Pacific Railroad; however, he failed his efforts against the railroad-controlled legislature. Stoneman supported prison reform and staunchly believed in rehabilitating prisoners through parole - so much so that in the last few weeks of his term, Stoneman granted 260 pardons and commuted 146 prison sentences. In 1887 Stoneman returned to his San Gabriel ranch for a few years. In 1891, he moved to Buffalo, NY to live with his sister. He suffered a stroke in April 1894 and died in September 1894. Use the California State Library’s interactive tool to view Executive Orders and Proclamations signed by Governor Stoneman.